Empire Fortune is a 5 reel, 20 payline slot game from Yggdrasil Gaming that features opulent visuals and a captivating soundscape, but the highlight is an innovative and feature-packed jackpot bonus game, where 3 separate progressive jackpots are up for grabs. Empire Fortune slot shares a jackpot pool with popular title Joker Millions - "Ultra" jackpot - and it offers two extra smaller jackpots - "Diamond" and "Gold". The game allows you to hold 2 free spins or bonus symbols for a chance of hitting a third symbol on the next spin. 3 or more bonus symbols trigger the Jackpot Wheel mode. The bonus game takes the form of a 3D wheel of fortune, with the chance for a range of different prizes, including coins up to 250x your wager, up to 30 free spins, mystery prizes up to 500x your bet and more. A unique "fireworks feature" during the bonus game sees a number of rockets launch and land on different areas of the wheel, with the player picking up prizes depending on where the rockets land. • Ultra Jackpot – hit the joker symbol on the top level. 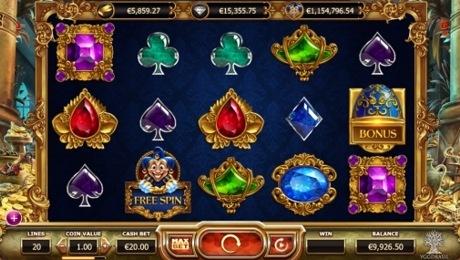 • Diamond Jackpot – hit the diamond symbol on the top level. • Golden Jackpot – hit the gold bar on the middle level. Triggering the Wheel of Fortune with 4 or 5 bonus symbols will instantly win you a spin on the middle or top level respectively, otherwise you have to work your way up. The lowest possible amount of the Ultra jackpot is 100,000 €, so the minimum is not too bad at all. The average return to the player (RTP) percentage is 95.5%.